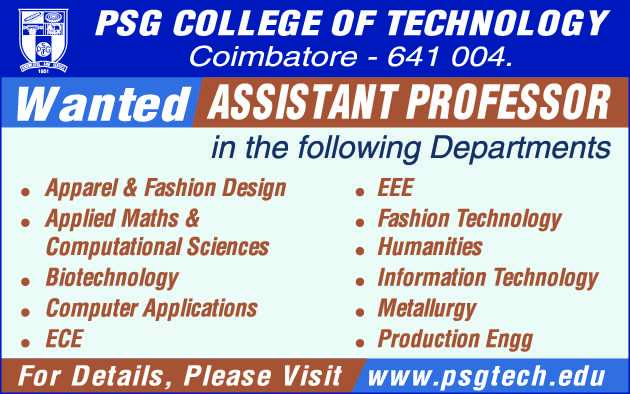 PSG College of Technology, Coimbatore has advertised in THE HINDU newspaper for recruitment of Assistant Professor jobs vacancies. Interested and eligible job aspirants are requested to apply on or before 30th April 2019. Check out further more details below. How to Apply: Application in the prescribed form completed in all respects should be accompanied by true copies of degree, testimonials etc., in support of their age, qualifications, professional experience etc., and other academic distinctions, reprints of publications if any. The original certificates must be produced at the time of interview. Application completed in all respects, together with enclosures aforesaid, should be addressed to the PRINCIPAL, PSG COLLEGE OF TECHNOLOGY, PEELAMEDU, COIMBATORE – 641 004 (Tamilnadu) and sent by post to reach College office on or before 30.04.2019.